As publicists who send me review copies can attest, unless I’m working with a magazine deadline, I rarely write CD reviews close to an album’s release date (I’m finishing up one such review today, in fact) – usually it’s a few weeks late. On rare occasions, I’ll review one far in advance – which from an artist’s or publicist’s perspective doesn’t help things much from the sales aspect. Would you expect to see a review of a movie that won’t be out for six weeks? Of course you wouldn’t. 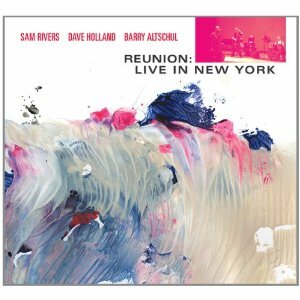 That’s why I am reposting the review of the fantastic new album from Sam Rivers, Dave Holland and Barry Altschul, which dropped this week. If you missed my review of it from last month, here it is. And if you don’t feel like reading it, just go out and buy it out of sheer principle – it’s that good.